With a waterproof exterior shell composed of denier Soft-Touch polyester Hypertex, the Firstgear Allure Women's Waterproof Jacket maximizes comfort in the most uncomfortable situations. A 10 inch (ZIPS) attachment system integrates with your riding pants. There are two front pockets and an internal pocket made especially for your cellular phone that includes a hook-and-loop enclosure for security. 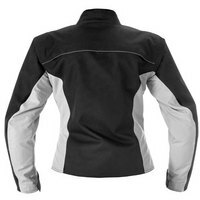 The double-stitched seams mean that this is a durable and resilient jacket, and reflective piping increases visibility in low light situations for added safety. Zippered vents in the cuffs and rear let you control airflow, and CE certified armor protects your shoulders and elbows. It also features heavy-duty, waterproof YKK zippers and an EVA foam back pad, and is available in pink, black (as shown), or baby blue. This waterproof jacket combines style and flexibility for a great fit and protection from the elements.